If you want to make a good first impression wherever you go, it’s important that you make an effort to make yourself look presentable at all times. Personal grooming doesn’t have to be time consuming, and just by treating yourself to a little TLC on a regular basis, you it’s easy to look immaculate even without a full face of slap! When it comes to personal grooming, many people concentrate on the obvious areas- such as their face and hair, and other smaller parts of the body often get neglected. One area that often gets ignored is the hands, although it really doesn’t take much for them to start feeling dry and chapped. Not only can this make them look awful, it can also play havoc with the state of your nails. Every day, in our professional and personal lives, we use our hands to express ourselves, and there’s nothing more embarrassing than sitting down for an important meeting, then realising that your nails look an absolute mess! Many people naturally have more brittle nails than others, which causes them to break far more easily. A good, strong clear nail varnish treatment can work wonders in stopping nails from splitting, as can the use of a good hand moisturiser. Dermalogica Multivitamin Hand & Nail Treatment is your key weapon in the fight against nasty looking nails, and will ensure that both the skin on your hands and your nails are kept hydrated and in peak condition. 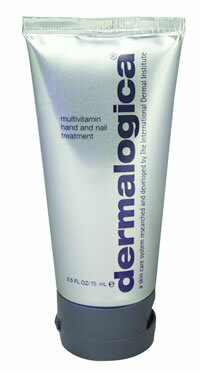 Don’t let your nails get in the way of you fully expressing yourself- let Dermalogica give you a helping hand!